RouterStatsHub 5A will now run on Windows 8/8.1 and Windows 10 computers. For use with the Home Hub 3. Monitoring line stats for ADSL lines only. It will not work with a fibre line as the stats are not accessible in the Openreach modem. For use with the Home Hub 5 Type A. Works with Fibre lines from router software version 4.7.5.1.83.8.204.1.11 onwards. Will also work with the Plusnet Hub One. Thanks to 'Adam' for the configuration information. Close RouterStatsHub5A and re-start it. There isn't a version of RouterStatsHub for the HomeHub 4 or HomeHub 5 Type B.
v1.3 Added Back/Forward buttons to scroll graph horizontally as a better alternative to dragging. v1.4 29 Jan 2015 ~ RouterStatsHub5A - Should now automatically detect the router's software version change to 4.7.5.1.83.8.204.
v1.4b 28 Feb 2015 ~ RouterStatsHub5A - Updated Help file. Added option to graph Line Attenuation or Signal Attenuation on User-defined graphs. v1.5.0 05 Sept 2015 ~ RouterStatsHub5A - Now runs on Windows 8 and Windows 10. Can now be closed and re-opened without clearing the graphs. v1.6 24 July 2017 ~ RouterStatsHub5A - Updated to attempt workaround needed after a Windows 10 software update. v1.9a 01 Jan 2018 ~ RouterStatsHub5A - Removed erroneous leading space character in default stats URL. v1.9b 17 Oct 2018 ~ RouterStatsHub5A - Modified 'Restore graphs at startup' to cope with corrupted data file. The http web interface seems to be the only way to access the Home Hub and the amount of data that's available is limited but we have to make do with what we have. 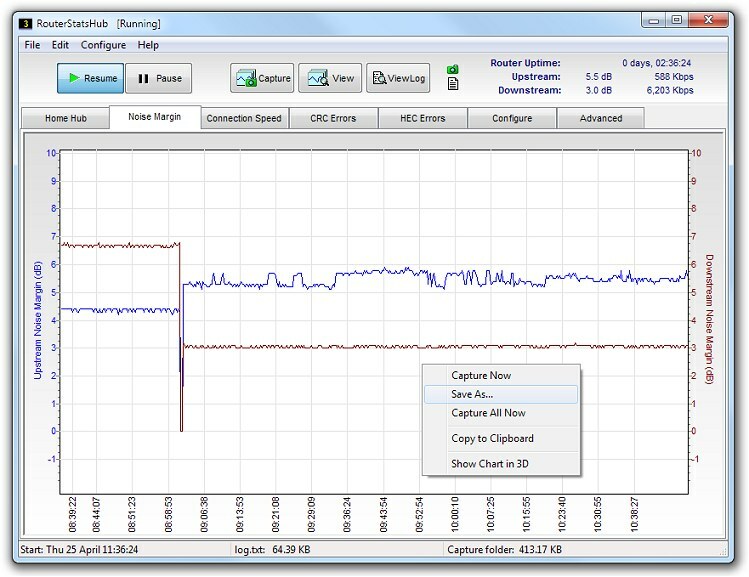 RouterStatsHub is able to monitor, and plot on graphs, upstream and downstream statistics associated with an ADSL telephone line. Simple adjustments to, for example, the location of the Hub's power supply brick can make a marked difference to these statistics and RouterStatsHub makes it simple to monitor the effect of any changes you make. Please read through these pages. There aren't that many and it may stop you missing some of RouterStatsHub's features! Please note that not all features are available on the Home Hub 5 version. RouterStatsHub is built around Internet Explorer's "engine" so is designed to run on Windows XP onwards. Depending on your browser's firewall settings, you may need to add http://192.168.1.254 as a 'Trusted' website in Internet Explorer's settings. Although it seems possible to run Internet Explorer under Linux, I have no idea whether RouterStatsHub would be able to work with it.